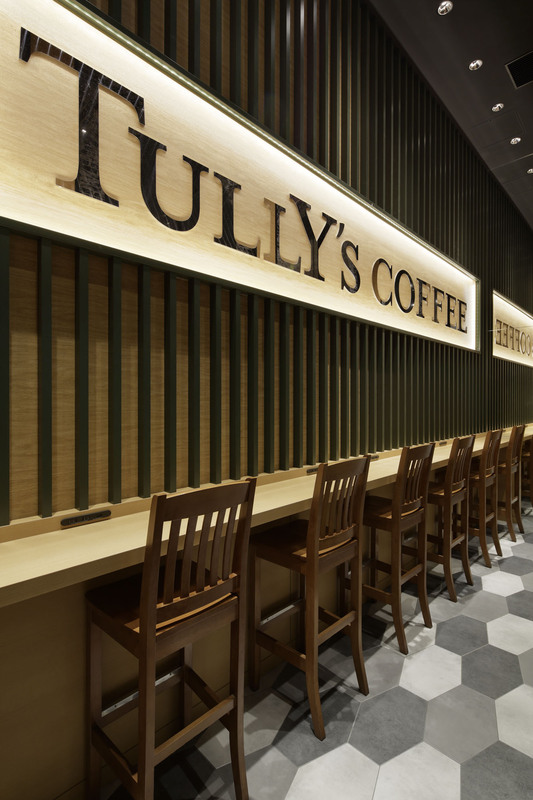 This latest Tully’s Coffee is not merely a unit store but it is a「BOOK & CAFÉ」style collaborating with a bookstore. The system goes like this. 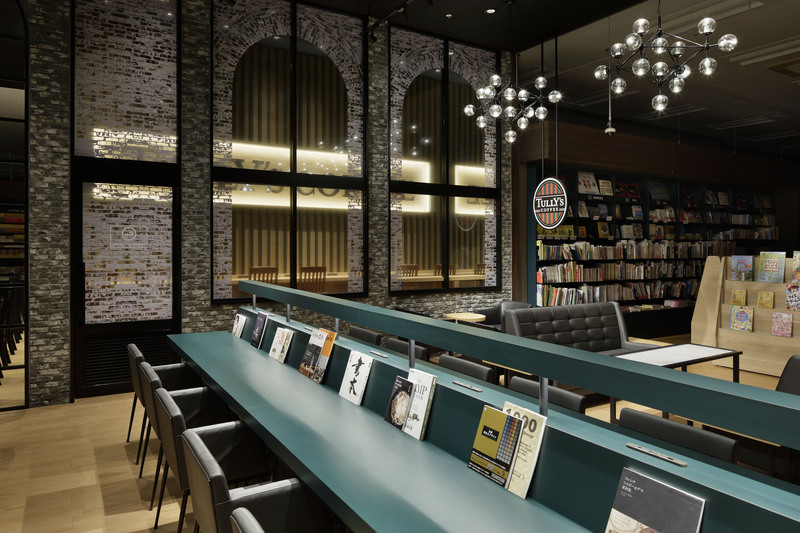 Anyone interested in any books and magazines from this bookstore can bring them into the café, grab a coffee and read them through even before purchase. 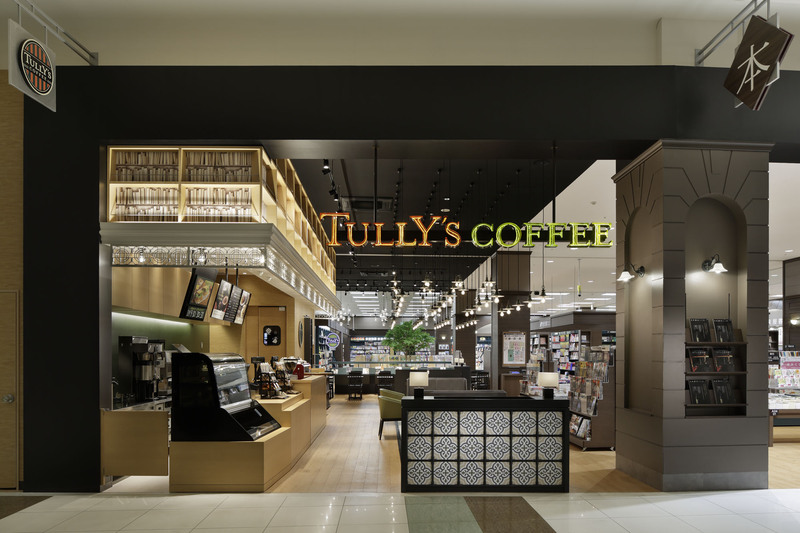 This bookstore and Tully’s Coffee have cooperative relations. Nevertheless they are fundamentally different brands. 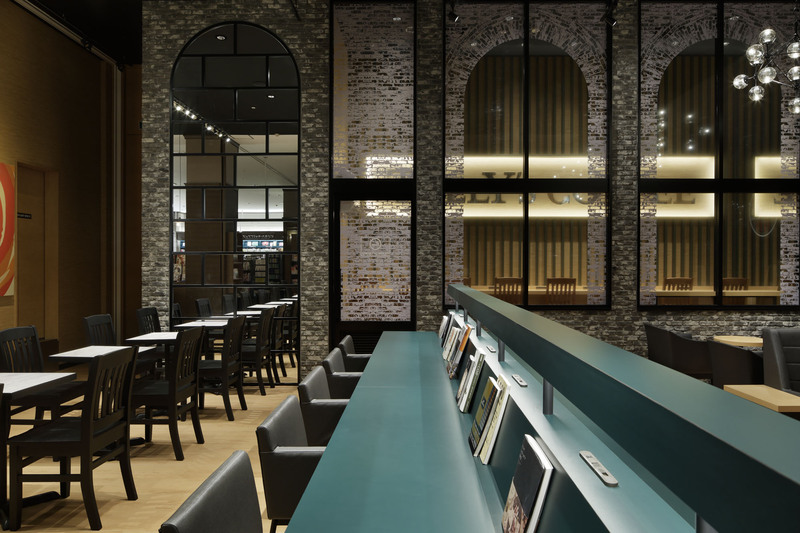 So, it is not a café space with a bookstore nor it is a café that has a library function. It was difficult to make a balance to express both identities and to bring unity impression. 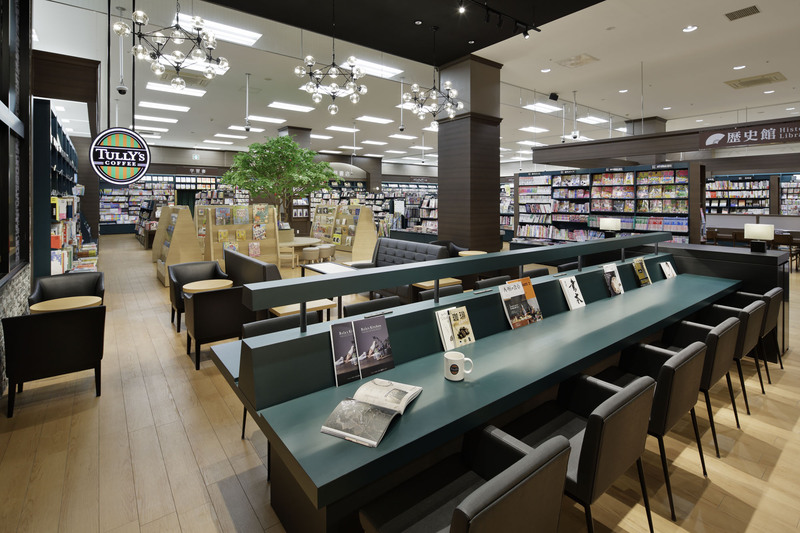 First of all, the compartment was bounded on two wall surfaces of the bookstore. Therefore, it was unnecessary to build walls or partitions. Identical floor materials were used to connect the two areas. 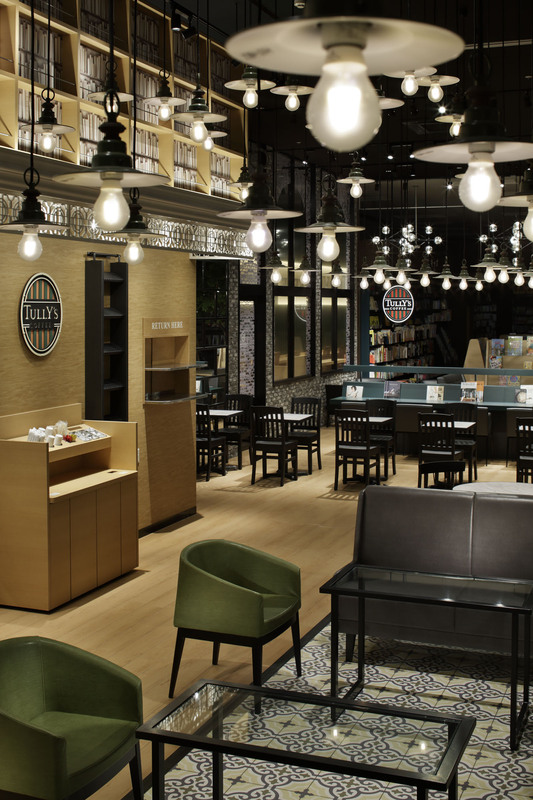 With effective collaboration with the bookstore, the shape and the layouts of the bookshelves were modified, layouts of the café’s furniture and seating enabled to gradually fade the boundaries between the two. 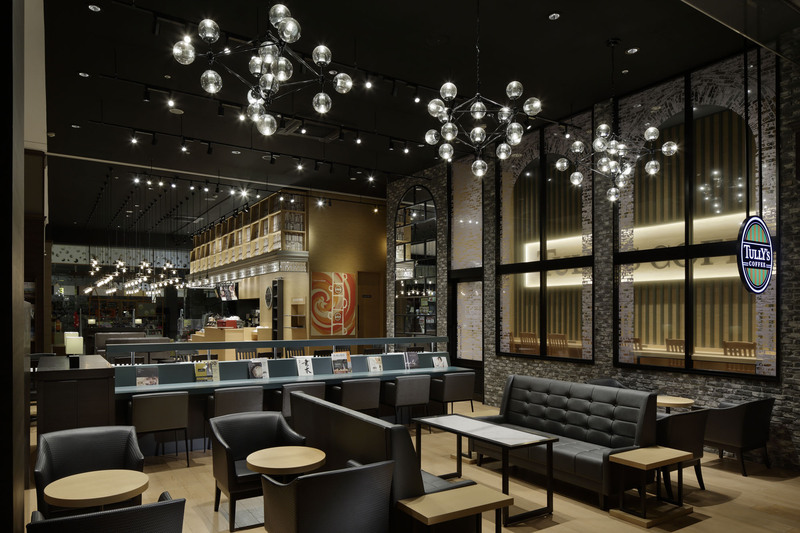 Second of all, we planned a distinctive difference and established cooperative effect incorporating illumination intensity and color temperature. 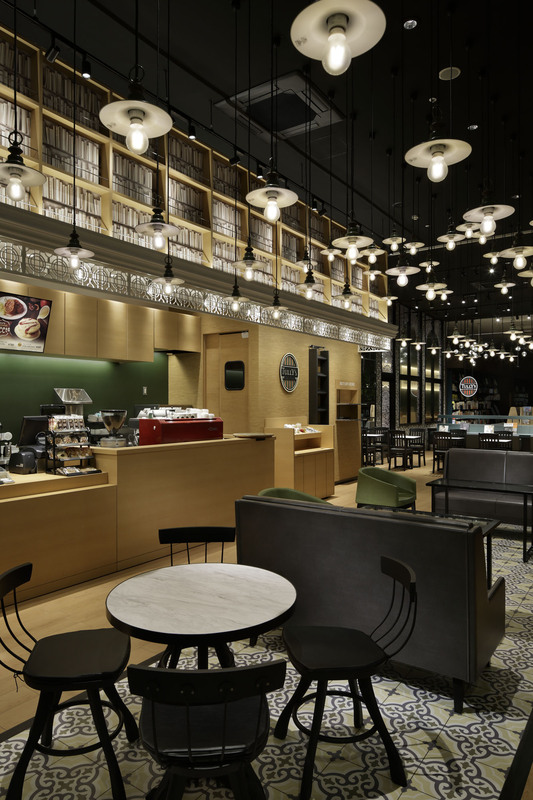 For creating relaxed café atmosphere, we selected those that will make contrast with the bright, high visibility bookstore. 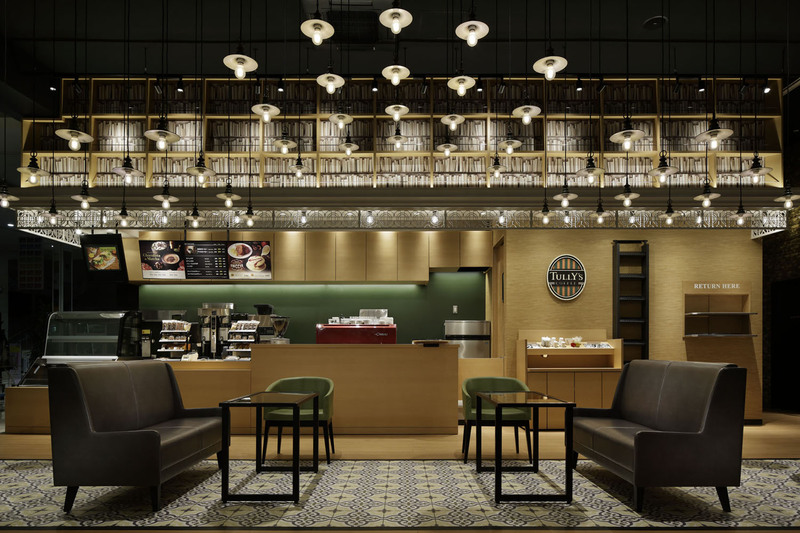 In this way, preparing the out frame in advance and then completing the individual designs brought two new challenges in designing this café. 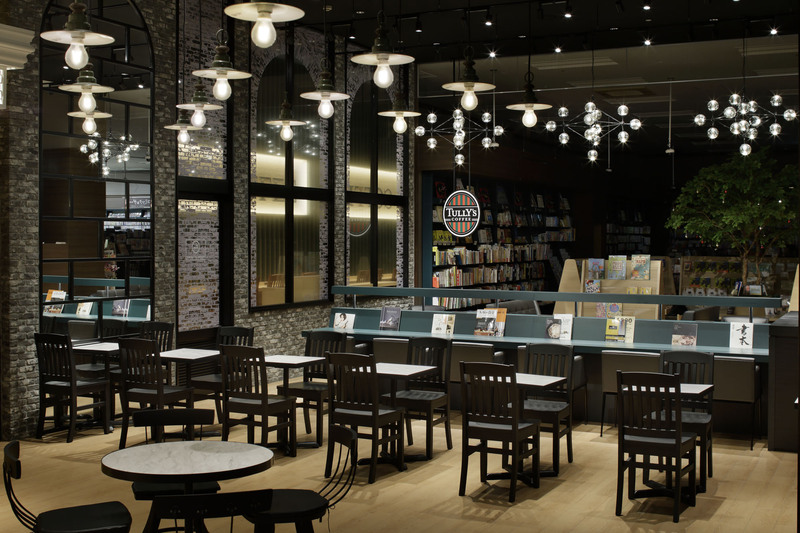 Arch of pedant lightings are set along the bookstore aisle and the café. 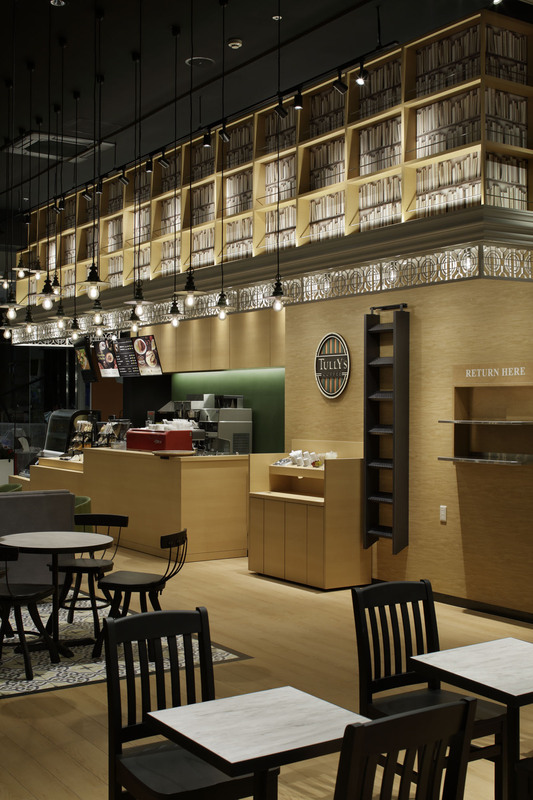 These enable to direct the customers smoothly to the café. On the other hand, at the pelmet of the café-providing counter, we wanted to offer a sense of unity as well as a slight difference. Trompe l’oeil of bookshelves printed on cloths are used to create this mild change. This trompe l’oeil art are also printed on the brick tile patterned glass surface of translucent-film and are used frequently in the room. 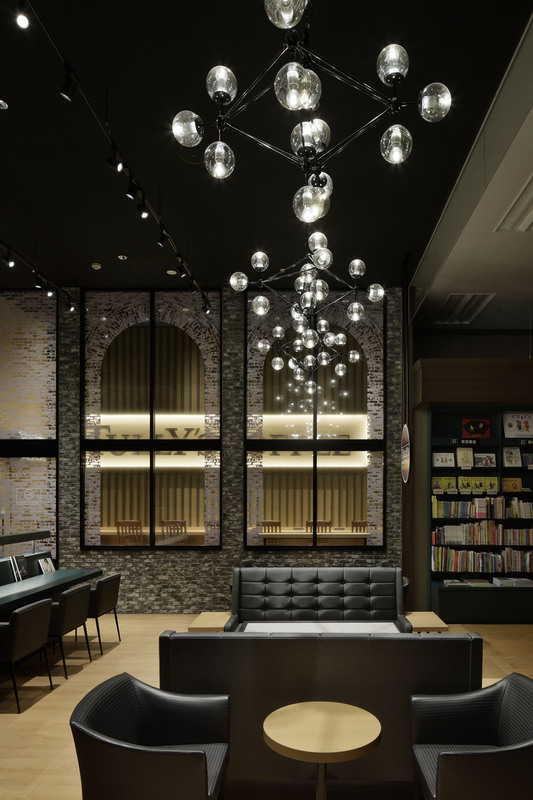 This indeed, set up the atmosphere of this café. 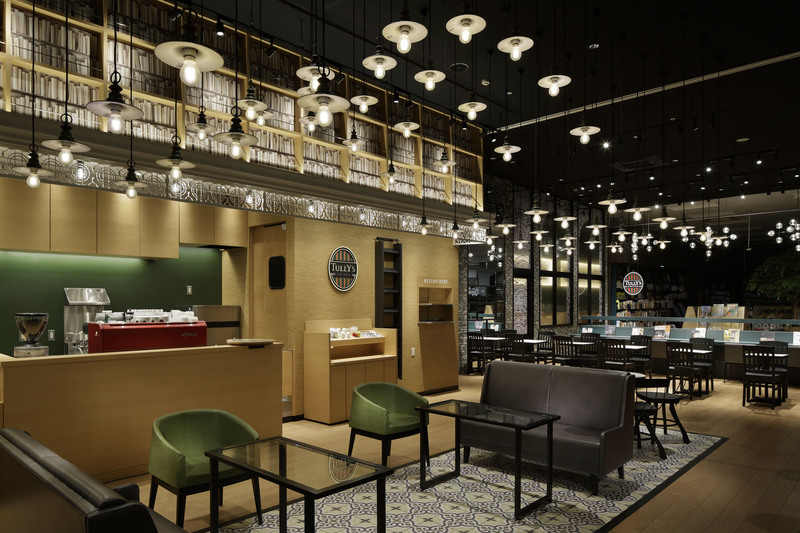 If we are to mention the method to adjust the distance between the café and the bookstore was what we had run for, we can also say that this café itself has its original designs that follow the fashion without using the standardized taste. 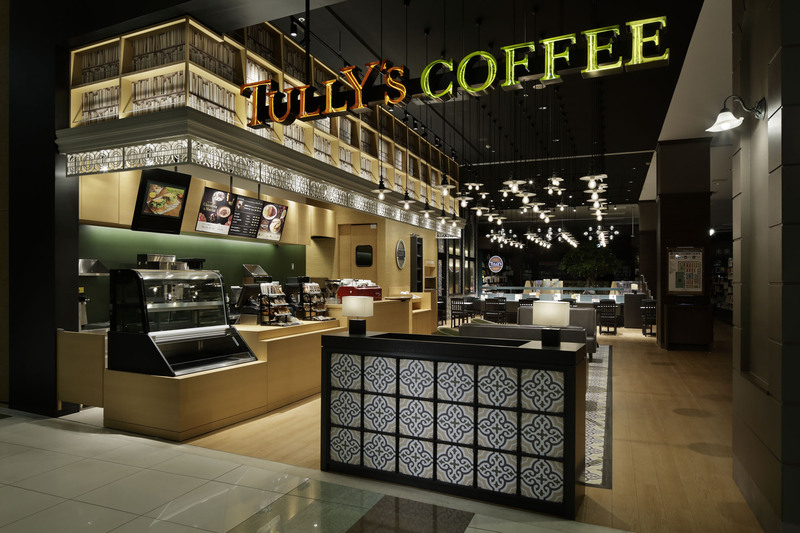 And this has become a significant element of Tully’s café style. To be more precise, all antique furniture and aging were eliminated. 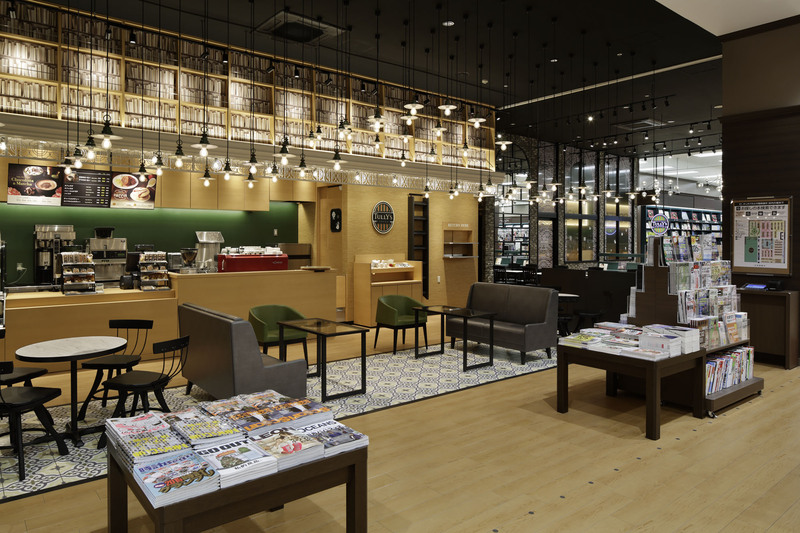 Combinations of materials and graphic development including trompe l’oeil, inspiration from the layout and sequence have all played significant factors in creating this café.